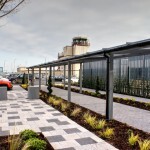 As part of a major redevelopment to the premium car park at Liverpool’s John Lennon Airport, Twinfix have installed a 3m wide walkway that enables continuous under-cover access from the car park into the airport building. 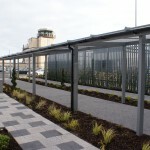 The 35m long mono-pitched structure is manufactured from aluminium powder coated dark grey (RAL 7037). Aluminium is an ideal choice in this application as it won’t rust if it gets the odd knock from a suitcase, neither will it require painting again, so an annual wash down means it will keep its good looks for years. 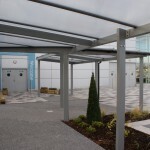 Twinfix Multi-Link-Panels glazed with 25mm clear multiwall polycarbonate were used for the roof. 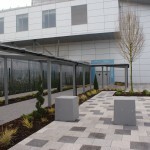 As these panels meet the non-fragile requirements outlined in ACR[M]001:2014 the airport management have peace of mind knowing that any unauthorised access on to the walkway roof should not result in falls through the glazing. 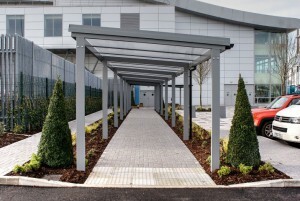 The exceptionally quick turn-round required meant the Twinfix team had to pull out all the stops, with meticulous co-ordination between their sales, design, planning and installation departments. 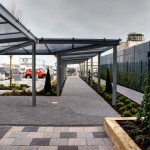 Their many years’ experience in this marketplace paid off and the walkway was installed on time, ready for the Christmas rush at the airport! My first thoughts on hearing about BIM (Building Information Modelling) was how is this going to work? A great concept in theory, but how will the practicalities work and will it help drive efficiencies, or will it just be more work? We all work in high pressure environments where time is money, and we must look at which activities add value and which do not. 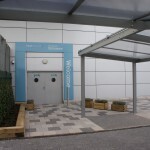 Certainly for a relatively small manufacturer like ourselves we need to be careful when deciding what we sign up to, so my initial thoughts on BIM where somewhat reserved. The idea of a model showing every detail of a building which can be manipulated seemed very science fiction. It led me to question how does it work in practice and will specifiers and the industry actually use it? Our BIM journey began with the BIM day in Manchester and embracing the BIM challenge. I embarked on the two day conference with mixed feelings. 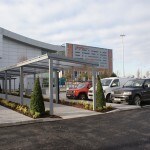 However, it was soon apparent that BIM was exciting, and although challenging, was fundamentally an efficient and forward thinking way of constructing a building. I began to feel excited by this new and challenging prospect. So as I began to learn about this new concept and terms like COBIE (Construction Operations Building Information Exchange) began to make sense. I quickly started to understand how BIM could benefit us, both at specification stage and throughout the whole design process. I felt assured that the upfront work needed for BIM would have long term gains. Preparing the objects that contain the information you need means less rework, less duplication and a much smarter way of working. As we all know, working smarter is the sensible way forward. 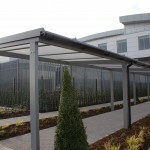 We embraced the concept and commissioned NBS to author our canopy products. They worked with one of our in house designers to construct our rather complex models, understanding how our canopies worked. Once completed, I went into the webinar where NBS demonstrated our products with bated breath, concerned about how they would look. I need not have worried as they worked better than anticipated. In fact, the result was a good looking, rather clever object that was easy to understand and manipulate. 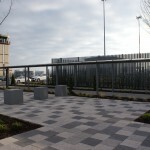 I believe we are the first canopy manufacturer to have these objects and I’m very proud that Twinfix took this bold step. The future is here. We have BIM. We have a 3D printer. And most importantly, we are a British manufacturing company embracing the future… how exciting! The science fiction that I believed BIM to be is now very much a reality.